and other Group D Posts. Candidates who are qualified 10th class they are eligible for applying this RRB Group D Posts online. Application mode is online for this RRB Group D Jobs. Online application form will be available from 10-02-2018 and last date for online form submission to respective Railway RRB is 31-03-2018. Candidates must have submit the application form online to get eligible for written exam. Candidates section will be based on merit in written exam (Tier1/Tier2), Physical Efficiency Tests, Documents Verification and Medical Tests. Written Exam will be held OMR based. More details about this Indian Railway RRB Group D Jobs recruitment exam notification, number of posts, exam pattern and syllabus, online application procedure and other details are given below. Candidates have to submit the application form to their respective Railway Zone RRB website only. 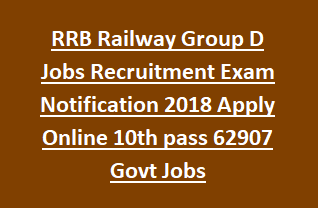 There are total 62907 Group D Posts in this RRB Recruitment 2018. As on 01-07-2018 candidates age limits are 18-33 years. Age relaxations are applicable for reserved candidate as per RRC norms. Candidates must have qualified 10th class or ITI pass or its equivalent qualification for applying this RRB Group D vacancies. Examination fee is Rs.500 for Gen/OBC candidates and for others Rs.250/-. Candidates can pa the exam fee either online or offline. Candidates selection will be held through written exam, physical tests, documents verification and medical tests. Written Exam will be conducted for 100 marks. Exam duration is 90 minutes and total 100 questions will be given from four sections. For each wrong answer 1/3 mark will be deducted. Exam paper will be given in English, Hindi and local language of respective state. Candidates must have secure the maximum marks then only there will be a chance for getting shortlisted for Physical tests. Candidates who are qualified Written exam they have to undergo for physical tests. PH/PWD or Physically Disable candidates are exempted from the Physical Tests. Candidates who are interested in this RRB Group D Posts they can apply online on or before 31-03-2018 through their respective RRB /RRC website. or you can get your website from www.indianrailway.gov.in. Exam will be in July Ending.